Does your four-legged friend need room to play and run? Pet turf is a great solution that will keep you and your fur babies happy. You can order pre-cut or custom-cut sizes to fit your yard. With realistic colors, our pet turf is a low-maintenance option to keep a lush landscape all year long. 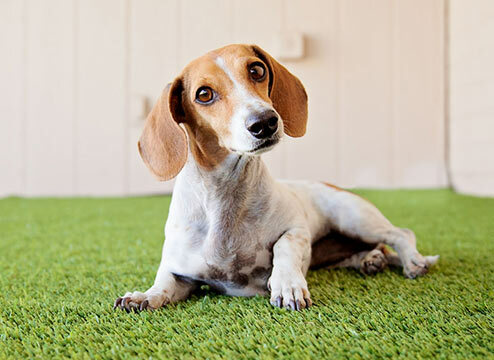 Why Use Artificial Grass for Pets? 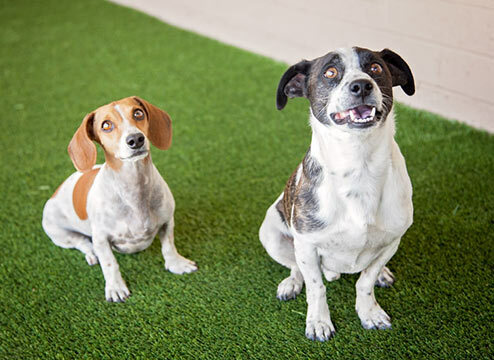 Using artificial grass for dogs and pets has several benefits over the real stuff. Many of our landscape turf rolls are made intentionally with a slight curl and flatter blades, making them more pet-friendly. 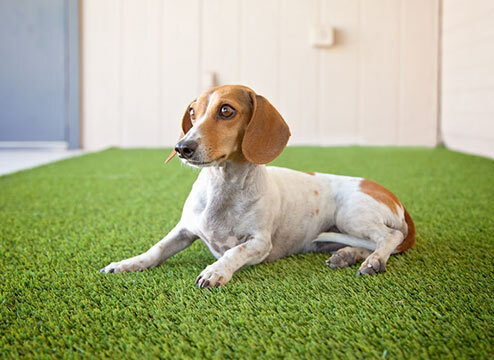 Your pup will love rolling around in a soft bed of fake grass without pricklies poking at him. Our pet turf ensures that your backyard is a haven to your dog. 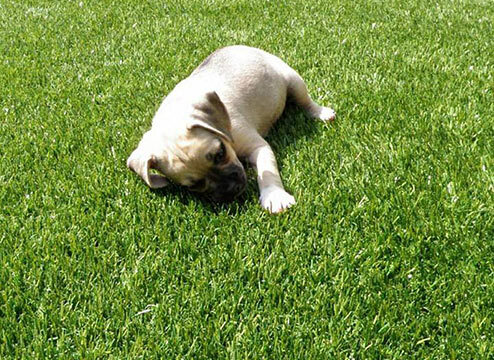 In fact, fake grass for dogs is quite the low-maintenance alternative to caring for a real lawn. With a realistic, natural look and feel, pet turf helps you conserve water and save money on monthly maintenance costs. Just think how much more time you’ll have to play fetch without all that mowing and weeding! Lead-free: No need to worry about your pet or kids being exposed to toxic metals. Dog turf is a safe landscape option for your home. Increased lead exposure was a concern with synthetic grass years ago, but today’s artificial turf contains no detectable traces of lead. No need for fertilizers, herbicides and pesticides: A great feature about pet turf is that it does not attract bugs, so you will not have to use insecticides and harmful chemicals on the artificial grass. Especially if your dog likes to chew grass, using chemicals for regular lawn care should be a concern. Synthetic grass requires no chemical use to keep the bugs away and the yard looking great. Bacteria-free play area: A concern with real grass is bacterial buildup in your dog’s favorite bathroom spots. Eradicating bacteria that seeps into the soil can be difficult and unsafe for pets or kids. A great thing about synthetic turf is that it has perforations to drain those liquids. Our pet turf actually drains more than 30 inches of rain per hour per square yard! Additionally, when you use an anti-microbial infill, like Durafill, and perform the simple routine maintenance on the pet grass, bacterial buildup is usually not a concern. Use artificial grass to create the playpen of your dog’s dreams right in your own backyard! If you run a dog park, you’ll love how much easier it is to maintain a clean area with artificial grass. OR maybe you want to mimic the great outdoors inside of your doggy daycare shelter or pet-grooming salon - the possibilities are endless! Artificial grass for dogs also works well as an indoor potty. If you can’t get home during the work day or your dog doesn’t want to go out in the rain, create a little bathroom pad for him out of synthetic turf rolls. Train your pup to use it so he’ll have a safe place to go when he can’t do his business outside. When you’re deciding on what kind of pet turf to buy, check whether the product is best for indoors or outdoors. Many indoor turfs feature nylon, a fiber that will fade in direct sunlight. Choose an outdoor turf for a glowing-green lawn! To keep that summer-green look to your landscape all year long, you’ll want to choose our Pet Turf Rolls or our Free Time Turf Rolls which are great for both indoor and outdoor applications. A dog favorite, Pet Turf rolls are comforting to even the most sensitive of paws. 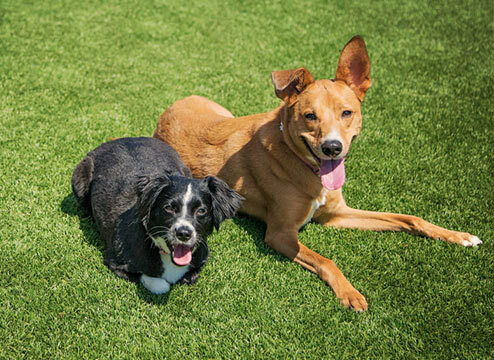 This dog turf is perfect for heavy-duty play time. If you have more than one pet or want to maintain a nice dog park for several pups to roughhouse in, these pet grass rolls are thick and durable enough to withstand heavy paws. This product’s short pile height helps drain any liquid, keeping a sanitary environment that pups will be eager to play in. Free Time Turf Rolls are awesome for your backyard, allowing you to enjoy a barefoot summer night with the dog. With holes in the backing, this premium turf product allows water to easily flow through. No need to worry about bacteria buildup where your pup chooses to relieve himself! Okay, so you’re ready to spoil your pup with his own dog turf, but how do you know what to look for in a pet grass product? The most important factors to consider are the turf’s face weight, pile height and thickness. Artificial grass and dog turf products have a face weight - the amount of material used in your turf per square yard. This is one of the most important factors when choosing the right dog turf. Essentially the higher the face weight, the more durable the product. If your dog is full of energy and you want to keep your yard looking fantastic, go for the product with the highest face weight. We offer face weights from 5-90 oz. Be leery of any artificial turf products you see with a face weight over 90, as companies have been known to include the backing to show a higher number. We offer full documentation and free samples, so you can see and feel the difference for yourself. Pile height or thickness add to the turf’s rich appearance. 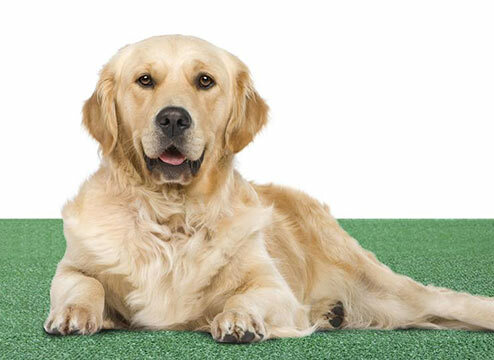 The thicker the turf, the more comfortable the artificial grass will be for your pet’s paws. However, we don’t make our pet turfs too thick to where they irritate their paws. We want their backyard to be a comfortable, adventurous playpen! Lay, fit and seam the turf. Seaming options include nails, glue and seam tape or staples. Use a filler product to help your synthetic grass blades stand up and keep their lively appearance. Infill is an essential solution for pet turf as it keeps the blades looking great even through heavy bouts of play time. The product helps weigh down the synthetic turf to keep the blades from getting wrinkles or ripples. Durafill is a pet-friendly non-toxic, non-absorbent synthetic soil that prevents bacterial growth. When your dog marks his territory in the yard, Durafill ensures that any liquids are properly drained. Since it doesn’t retain moisture, this product helps keep your synthetic grass sanitary for your pup. No mildew, mold or pungent smells for your dog turf! Large granule Durafill is best suited for pet and landscape turf. You’ll want to spread about 1.5 pounds of Durafil per square foot of turf, and one bag covers about 33 square feet. We love pet grass for our pups because it’s cooler than pavement and asphalt on those blistering hot sunny days. Unfortunately, synthetic grass is known to get pretty warm in direct sunlight. That’s why dogs love when their owners use Hydrochill on their turf. This unique infill helps your fake grass act like real grass and release water to cool itself. 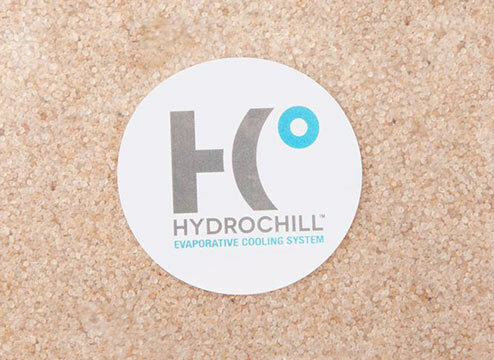 Hydrochill can help cool down your turf for days depending on your local weather conditions. Studies have shown that it can even keep your turf 30-50 degrees cooler than most standard synthetic turfs! Hydrochill is non-toxic, safe for pets and UV-resistant. You’ll want to mix this product 50/50 with regular silica sand to cover 2 pounds per 1" pile height of turf. Pets - although we love them - come with all kinds of unpleasant smells. Use Zeolite Max infill to keep your pet grass smelling clean in spite of your dog’s scents. This infill works wonders by trapping and neutralizing ammonia-based odors by direct contact or from the air. You may use this non-toxic, biodegradable infill on its own or as a mix-in with other infills. You’ll only need to apply it once, and we recommend placing it both beneath your turf and over the top. Artificial grass is a low-maintenance alternative to a conventional lawn. Easy to clean and maintain, pet turf doesn’t require mowing, watering or fertilizing to keep it looking lush. You can clean up after your pet with a pooper scooper, plastic bag - whatever method you enjoy most! Then simply hose off your pup’s favorite bathroom spots. The great thing about our pet turf is that it has drainage holes to get rid of pet tinkles. Keep your artificial turf smelling great with a spray of our Turf Fresh, a non-toxic spray with an active-bacteria formula that mitigates dog urine smells that may linger. The Zeolite Max infill is also great for keeping your alternative lawn smelling fresh. You may also use a warm-water solution of household detergent and water, or a mixture of white distilled vinegar in an equal amount of water. Never use bleach on your pet turf - most dogs don’t look great as platinum blondes! Rather than dragging out the lawnmower on a hot summer day, you’ll be happy to do a light sweeping every once in a while instead. If Fido plays hard and your turf becomes matted, use a synthetic brush (never a metal or wire-bristled brush) to brush the surface and bring your grass back to its lively appearance. Glowing green: Don’t worry about the sun or pet pee fading out your fake grass. Synthetic turf is UV stable and durable through heat and frost. Enjoy green grass all year long! Non-toxic: Relax knowing your pet is playing on safe turf - no lead, heavy metals or chemicals found here! Indoor/outdoor installation: While Fido may love to play outside, he might not be psyched about going out there to relieve himself during a thunderstorm. Give him an indoor turf to use for emergencies! Ready to give Fido the yard of his dreams?